Gurugram, July 23, 2018: Jabong, India’s leading online fashion brand, today launched its new marketing campaign to promote the 4th edition of its biggest sale of the year- the Jabong Big Brand Sale- which will be held from 27th to 30th July. Big Brand Sale (BBS) is Jabong’s marquee bi-annual property that is held in January and July to mark the end of on-going season. 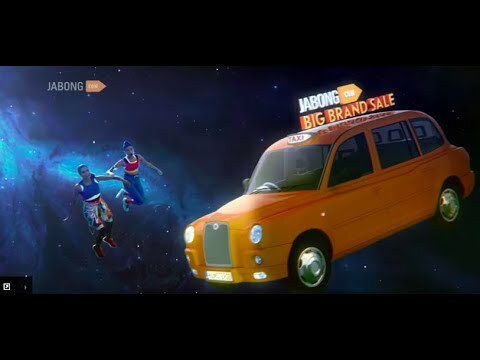 As a part of its 360 degree campaign, Jabong released a #OutOfTheWorld themed 30sec TVC, which is set in a magical, parallel universe and captures the essence of BBS where the World’s Biggest Brands are available at Out Of The World Discounts. During BBS, Jabong is offering 4 lakh styles from premium, international and Indian brands at 55%- 80% discount, out of which over 1 lac styles are for the first time on 50% + discounts and more than 15,000 styles are available at above 80% discount. The TVC highlights the Jabong consumers who are free from worldly notions of fashion and have their own unique style and identity, staying true to Jabong's brand philosophy- Be You. Set against a vast, celestial backdrop and a flickering panorama of space, the TVC beautifully uses spatial objects like stars, satellites and shooting stars to creatively bring alive the ‘out-of-the-world’ experience that the Big Brand Sale promises, in terms of, both, products and discounts. Conceptualized and scripted by Happy Mcgarrybowen, the creative agency from Dentsu Aegis Network, the TV commercial will be aired across leading channels, GEC, English & Hindi Movies, English Entertainment, News, Lifestyle and Music genres. The television commercials will also run in 5 second stings across select channels to drive frequency and reach. In addition, the campaign also covers print, radio, outdoor DTH (Tata Sky) and digital-YouTube, Facebook, Wynk and Truecaller, with OOH across 8 cities. Jabong is also collaborating with popular content creators like SIT and leading fashion influencers to amplify campaign’s consumer reach. Jabong will allot exclusive slots to select shoppers on 26th July to make purchases via wishlisting, coupled with lightening and mystery deals throughout the 4 days for enhanced consumer engagement. Customers can also earn slots by playing fun games on the Jabong app to buy their favourite products before they go out of stock.